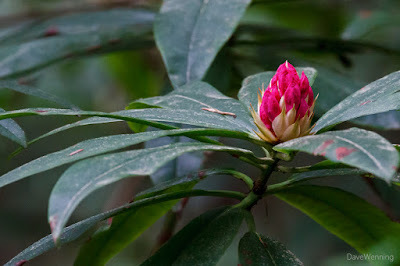 I have been announcing the hike schedules at Twitter and noting the "bloom potential" for the rhodies using this rating system. So far, they have been accurate predictions. I would rate this flower ★★★☆☆. If you are interested in coming along on the hikes, watch my Twitter feed and look for the hashtag #rhodyhike for dates and times. The next one will be tomorrow (Saturday), May 2 at 08:30 a.m. We'll meet at the North Beach parking lot. I have posted complete information about the hikes here. The bloom potential for Saturday's hike should be ★★ or ★★★ and possibly ★★★★ out of five stars. Here is one more photo of the Pacific Rhododendron (R. macrophyllum) from yesterday's hike. There are also orchids growing along the Rhododendron Trail in Deception Pass State Park. 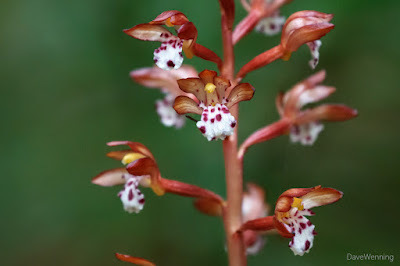 Altogether, there are 41 species and subspecies of orchids in Washington State. 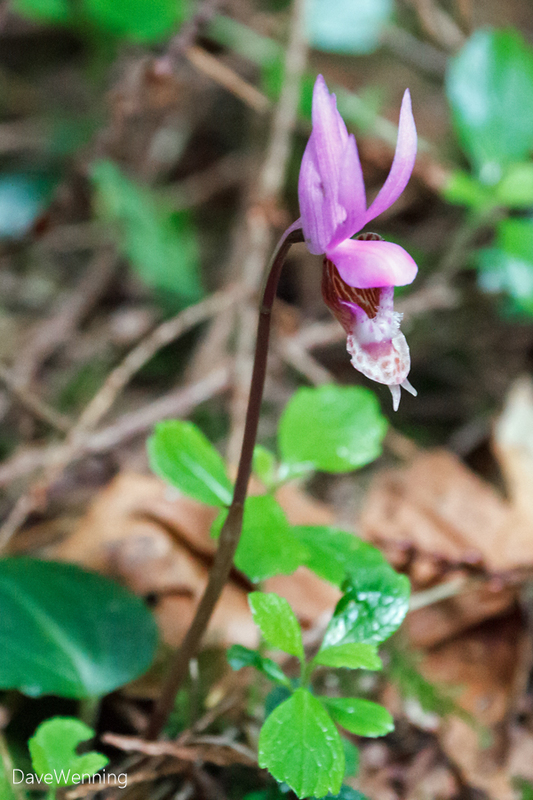 This one is Fairy Slipper (Calypso bulbosa) growing on the Lower Forest Trail. It is small, but that spot of pink in the shade makes it easier to find. According to Pojar and MacKinnon, this little orchid is disappearing due to trampling and picking. Picking the flower damages the delicate roots and usually causes the plant to die. People, don't pick the orchids! 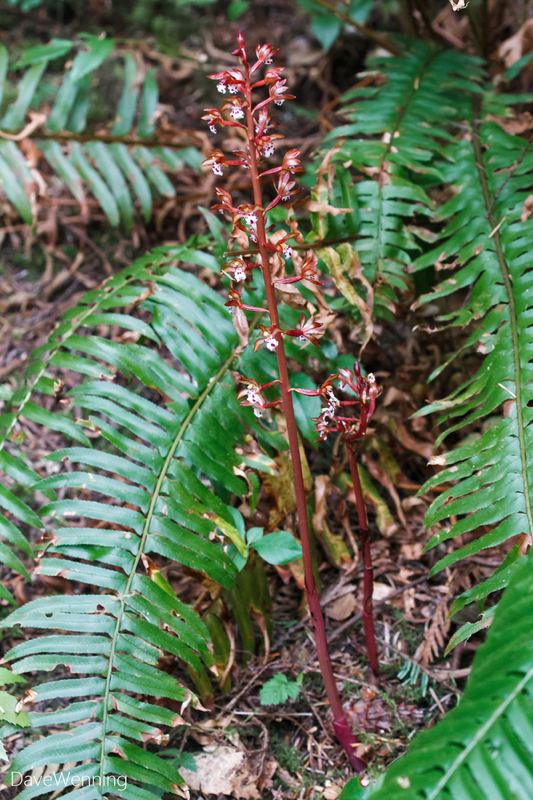 More than a foot tall, this orchid is Spotted Coralroot (Corallorhiza maculata) also growing on the Lower Forest Trail. Notice that this plant has no leaves. It is a parasitic orchid deriving its nutrition from mycorrhyzal fungi in the soil. Recall that rhododendrons also rely on these fungi for nutrition and disease protection although not to as great an extent as this orchid. A closeup reveals the tiny orchid blossoms of Spotted Coralroot. Based on photos, this is probably the Western Spotted Coralroot (Corallorhiza maculata var. occidentalis). 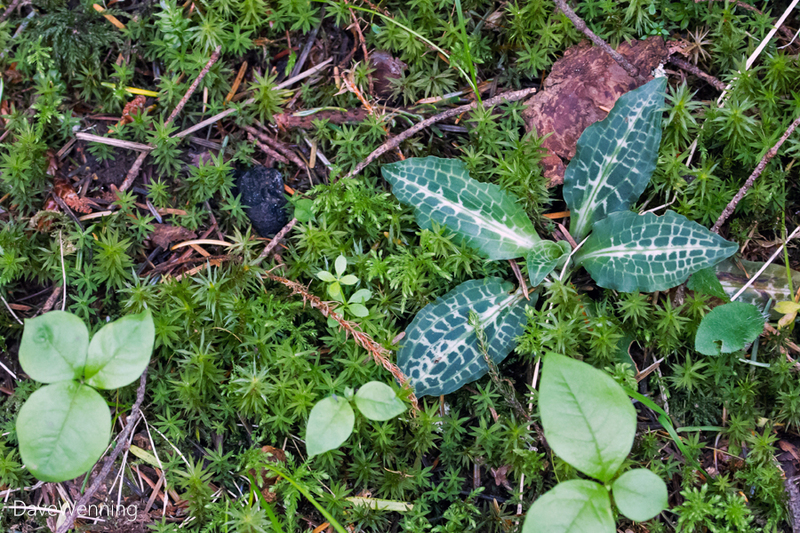 Finally, Rattlesnake Plantain (Goodyera oblongifolia) is probably the most abundant little orchid in the region. 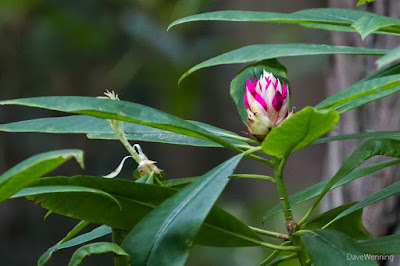 I have seen it growing along virtually all of the forest trails in the area. This one was photographed yesterday along the SW Goose Rock Summit Trail. Goodyera also relies on symbiotic soil fungi for nutrition allowing it to thrive in full shade. Although I have spotted the leaves numerous times, I have never seen this one bloom. When it does, it looks like this. This is a midsummer bloomer when I usually avoid the tourist crowds on local trails. I guess I will have to try and find one blooming this year. It was probably named for the snake-like pattern on the leaves. 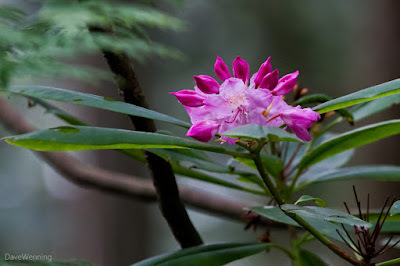 Since I seem to be including a wildlife photo in each rhododendron post, here is one from yesterday's hike. 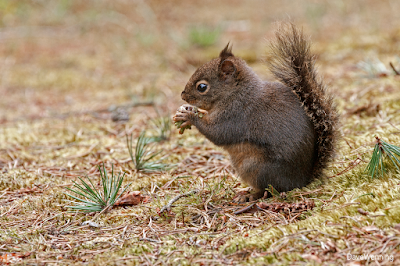 I found this Douglas Squirrel (Tamiasciurus douglasii) at the Goose Rock summit. He was munching on a pollen cone from the nearby Shore Pine and didn't seem much interested in me. Notice the bits of pine needles on the ground around the squirrel. Apparently, they snip off the tips of the shoots to get to the cones. I have seen these branch tips on the ground in other places where the squirrels feed. Finding orchids in Pacific Northwest forests requires a little care and effort. They are often small plants, may be growing in shady places and can be somewhat camouflaged among other foliage. You have to move slowly and look carefully to find them. Also, when hiking in the woods, be careful where you put your feet. Avoid stepping into the foliage along the trail edges without looking first. Keep that Labrador on a leash and under control. You could inadvertently destroy some rare and beautiful plants.